Enter to win any SPOOKY book of your choice. YA/NA/Adult... whatever your heart desires! 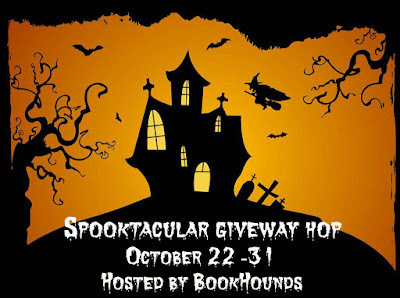 Enter to win and then hop around to the other participating blogs. So sorry not a YA but all I can think of is The Half Killed by Quenby Olson man the writing was so amazing , totally freaked me out. Frost by Marianna Baer or The First of Hands and Teeth by Carrie Ryan. And The Trees Crept In. The Woman in Black by Susan Hill was really eerie!!! A book i just got ,Dangerous Waters, by CM Michaels. Your in my close vicinity! I live across the river but go to st louis alot.my sister in law lives over by the airport. If you do any book signings around here ,you should let me know! Not really YA, but I love all of Stephen King's spooky books. Needful Things and Carrie are two really good ones. The Anna Dressed In Blood books were really good! If m/m YA is okay with you, Evan Gilbert's BROWN-EYED DEVIL terrified me! I love paranormal romances, fanasty, and YA. And the Trees Crept in or Hell Hole is my recommendation. Wow what a incredible hop on here. Thank you for the opportunity. Sorry, I would not know any of them. I like to read all the cookbooks. I wish someone would have a giveaway for those. I liked Pumpkin Roll by Josi Kilpack. The Graveyard Queen by Amanda Stevens, but it's not YA. Sorry, can't think of any YA off the top of my head. Do you like wicked dinosaurs? Try Dinosaur Lake by Kathryn Meyer Griffith. Perhaps Stephen King's The Tommyknockers!? I don't really read spooky books (or it takes a lot to scare me). When I was younger I read a lot of Stephen King. I think the spookiest was Misery and it wasn't paranormal at all. Origin by Jessica Khoury. It's not straight up horror, but it is haunting. The House of Dark Shadows series is seriously spooky. There was a new short story collection, Scary Out There, which has a bunch of YA scary stories, and several are really good! Since I don't read really scary books, I can't help you with that! I recommend Miss peregrine's home for peculiar children. I liked the Cresswell Plot by Eliza Wass. Intriguing and kinda creepy! The Women in the Walls by Amy Lukavics. Thanks for the chance. I thought the Exorcist was a scary read. This might be too young but I heard Dark Life was good and scary. Try Dorothy Gale: Vampire Hunter It is a great YA read. About the only creepy YA (I think) book I can think of is Anna Dressed in Blood. It's an excellent book. The Girl from the Well! I highly recommend Miss peregrine's home for peculiar children and Nevernight!